RIO DE JANEIRO, Feb 2 2011 (IPS) - The growing presence of Chinese and Brazilian capital in Latin America’s energy sector is facilitating the construction of hydroelectric complexes, but is also the fuelling nationalist stances that are adding to the environmental criticisms of those major projects. The three biggest hydroelectric dams in Ecuador are being built by Chinese companies, which have broken the hegemony of Brazilian construction firms like Odebrecht and Andrade Gutierrez. 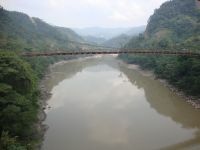 Financing from China’s Export-Import Bank, which is covering nearly all the costs, made those dams viable at a time when Ecuador had limited access to credit as a result of the public debt review promoted by the government, beginning in 2007, and its decision not to pay 4 billion dollars in debts, claiming it was not Ecuador’s responsibility. Brazil is also financing dam projects through its National Economic and Social Development Bank (BNDES). But those investments were hurt in 2008 when the Ecuadorian government of Rafael Correa expelled Odebrecht, accusing the firm of flaws in the construction of the San Francisco hydroelectric dam and demanding 210 million dollars in compensation. The competition between Brazil and China, which both have surplus capital and construction companies specialising in major projects, has created conditions favourable for exploiting the energy potential of Latin America’s abundant rivers. In Peru, this power bid already has a winner. Five hydroelectric complexes are to be built in the Peruvian Amazon region. “They are being planned in function of Brazilian interests,” which will be the sole beneficiaries, Alfredo Novoa, director of the non-governmental organisation ProNaturaleza, told Tierramérica. The environmental activist challenges the projects because he believes that Peru has sufficient energy-generating potential to meet current electricity demand, and can expand in the future through wind and other sustainable energy sources that do not entail the environmental and social costs of the dams in the Amazon jungle. This nationalist reaction to the expansion of hydroelectric dams also condemns the financing from BNDES, which has stipulated that Brazilian equipment and inputs will be used to build the dams in Peru. It is a mechanism that Brazil utilises to boost its high added-value exports, as well as the interest and revenues of its companies, which will be partners or builders of the dams. The energy agreement that Brazil and Peru signed in June 2010 for building five hydroelectric dams in the Peruvian Amazon was the result of “asymmetric negotiations,” said Novoa, because it establishes sales to Brazil of surplus electricity for 30 years. According to Novoa, Peru does not need new energy sources from the Amazon, but Brazil does, so it is evident who will benefit from the hydroelectric projects. “You don’t negotiate with Brazil, you just agree,” Peru’s President Alan García is alleged to have said in a private meeting with business leaders, diplomats and civil society representatives in Chile, according to a statement posted Jan. 20 on Twitter by Chilean political analyst Patricio Navia. The dams and electrical transmission lines to be built will result in the deforestation of 1.5 million hectares of the Peruvian Amazon, according to estimates by engineer José Serra in a study for ProNaturaleza. China has concentrated its investment in Peru in the mining sector, while Brazil has set its sights on fossil fuels, transportation infrastructure and hydroelectric dams in areas near the Peru-Brazil border. The capital from the two emerging giants played an important role in Peru’s economic growth and reduced its dependence on the United States, which has yet to overcome the economic crisis that exploded in 2008, political scientist Cynthia Sanborn said in a Tierramérica interview. Brazilian companies are active in a variety of sectors in the Peruvian economy, but “I haven’t seen much civil society resistance to those investments, with the exception of the hydroelectric projects,” said Sanborn, a U.S. expert who heads the research centre at the Peruvian University of the Pacific. Chinese capital has faced opposition after Shougang Hierro, which has had mining operations in Peru since 1992, caused widespread contamination with a spill of oils and lubricants, and was accused of violating labour laws, just as two other Chinese firms faced conflicts that ended in death and injury. Nicaragua is another country whose hydroelectric dams are in the hands of Brazilian firms, which have benefited from the fact that this Central American country does not have relations with China, because of its diplomatic ties with Taiwan. The Brito hydroelectric project, granted in 2007 to the Brazilian Andrade Gutierrez construction firm, set off controversy and criticism from environmentalist because the dam on the San Juan River would reverse the natural flow towards the Caribbean, sending it instead to the Pacific. The dam is to have a capacity of 250 megawatts, with an initial cost of 600 million dollars. Another Brazilian company, Queiroz Galvão, won the contract to build the Tumarín Dam, with the potential for 220 megawatts. As for Brazil itself, Chinese investment has grown dramatically in the last to years, in various sectors. Curiously, Chinese firms have focused on buying electricity transmission and distribution companies, as well as others active in Brazil’s oil fields. They are two types of investments: one to acquire reserves of non-renewable natural resources to meet China’s own growing demand, the other to generate employment for its citizens abroad and to export equipment, said Adriano Pires, an energy consultant and director of the Brazilian Infrastructure Centre. China is one of the few countries developing new technologies to carry out major infrastructure projects, but it will be hard for it to penetrate this sector in Brazil, as it did in Africa and Ecuador, because Brazil’s own construction firms are very competitive, Pires told Tierramérica. However, China is indeed a factor in the current boom in hydro and thermoelectric complexes, selling turbines and equipment at low prices. Chinese investment only appears to be “timid” because much of it does not appear in the statistics, like the cases in which they have bought majority shares in major companies, pointed out Luis Afonso Lima, president of the Brazilian Society for Transnational Corporation Studies. Such is the case of the Swiss automotive company Volvo, he said by way of example. But the focus of Chinese investment does not seem to be making electrical energy a priority in Brazil, he said. With nearly 3 trillion dollars in international reserves, China is working to transfer its investment in U.S. Treasury bonds to other assets, agreed energy consultant Pires. *Gonzalo Ortiz (Quito), José Adán Silva (Managua) and Milagros Salazar (Lima) contributed reporting. *This story was originally published by Latin American newspapers that are part of the Tierramérica network. Tierramérica is a specialised news service produced by IPS with the backing of the United Nations Development Programme, United Nations Environment Programme and the World Bank.